Your sciatic is the body’s longest nerve, beginning at your spinal cord and going down through your hips and buttocks, and then branching down to each leg. This nerve is important because it affects your ability to control and feel your legs. If this nerve becomes irritated or compromised, then sciatica occurs. Sciatica is a sensation that causes weakness or numbness along the sciatic nerve (hips, buttocks and legs) and can cause moderate or severe pain. Sciatica is a symptom of an underlying injury to the nerve or to an area that impacts the nerve, such as the bones in the neck and back. Since there are many disorders that cause sciatica, it is important to understand the underlying condition before developing a treatment plan. A review of your spine as well as your medical history will help understand if spinal adjustments and other chiropractic therapies are appropriate. Depending on your condition, chiropractic treatment can help by developing a plan to regain control of your symptoms to avoid invasive surgery. Since sciatica is often caused by herniated discs, Chiropractic treatment for the first six to twelve weeks after the onset of symptoms can be safe and effective. Treatment can include spinal manipulation. If it is determined that your sciatica is caused by other disorders beyond the scope of chiropractic care, then we’ll refer you to one of our many medical partners in Singapore to get you the help you need. Your history and X-Rays will be needed to find the exact source of your sciatica. Once it is known, it can be treated. Some treatment may require spinal corrections and manipulation. You may also need specific rehabilitation exercises and trigger point therapy. Gluteus Minimus Muscle ("Pseudo-Sciatica") - The gluteus minimus is the deepest of the gluteal muscles and is supplied nerves from L4 through S1. When the nerve is injured or compromised, the muscles are diminished and referred pain can occur. This often mimics sciatica and can be constant or severe in intensity. Spinal Stenosis/Lumbar Spinal Stenosis - Abnormal narrowing of the upper or lower spinal canal. This can put pressure on the spinal cord as well as the sciatic nerve. Spondylolisthesis and Cervical Spondylosis - A degenerative disk disorder where one spinal bone extends over another and can pinch the sciatic nerve. Piriformis Syndrome - A rare neuromuscular disorder in which the muscle that connects the lower portion of your spine to your thighbones involuntarily contracts causing sciatica because of the pressure on the nerve. 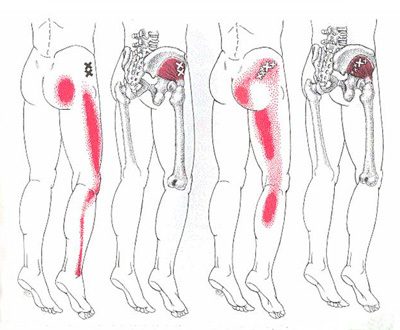 Sometime sciatica can occur after a fall or in the case of spinal/sciatic nerve tumors. The good news about sciatica is that the symptoms below usually only last for a short period (around six weeks) if you avoid activities that seem to trigger the problem. Of the people who experience sciatica for more than six weeks, many say it goes away with time.